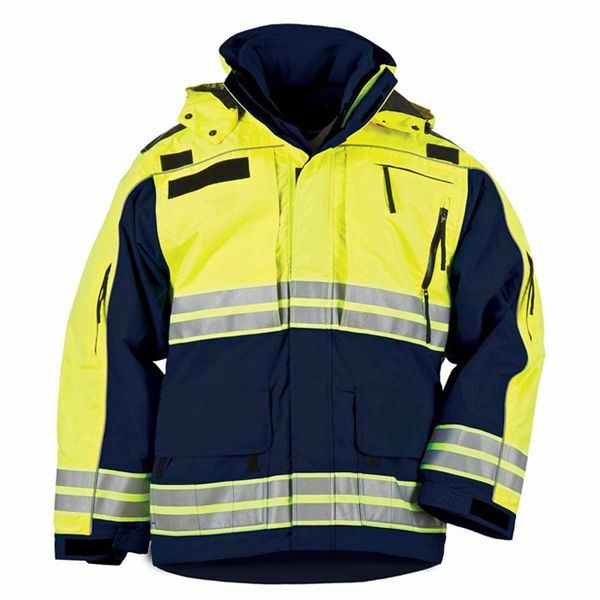 Engineered specifically for EMS professionals, the Responder Hi-Vis Parka gives you the utility, performance, and reliability to respond effectively. The waterproof, breathable construction keeps out wind and weather without heating you up during periods of high activity. A three-way adjustable hood, hook and loop storm cuffs, a double storm flap, and an elastic corded hem keep out rain and cold, while a water resistant radio pocket and shoulder mounted mic loops keep you connected. Abrasion panels at the shoulders provide traction for a backpack or duty bag, a patch panel at the right chest secures your ID, and zippered pockets at the chest and sleeves are sized for EMS accessories. Partial hi-vis construction and reflective tape installed at the hem, mid-line, and sleeves provide an enhanced visibility profile for night time or low light conditions.